I decided to re-scape my previous 32 Litre "Tree Scape" Tank and convert it into a flora/fauna holding tank, as i'm currently in the midst of preparing larger tanks for my future scapes too. To stock up on some plant selection in advance, i sourced assorted suitable plants from the various LFS, then properly cleaned and quarantined them before adding them into the tank. Although it wasn't my intention to create a scape (its just meant to be a holding tank after all), i still followed the usual layout of placing fast growing tall stem plants behind, slower growth lower plants in the middle and carpet plants in the front. I also made sure each plant group had some space between them to accommodate horizontal growth and propagation too. The plants are abit short at the moment, hopefully they eventually grow and fill up the tank soon. 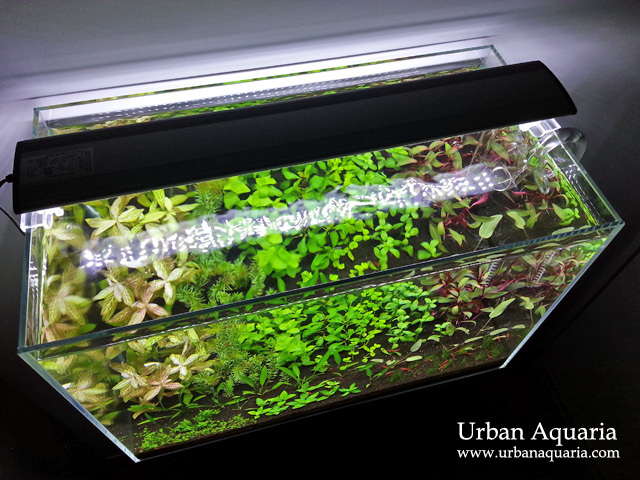 For now, i'll just be monitoring the growth rates of the plants and tweaking the conditions (adjusting flow, excel and fertilizer dosage, water changes etc) and see how well they acclimatize to the tank environment. It'll be a good opportunity to observe how the various plants grow over time. Although there is a relatively high fish and shrimp bio-load in the tank, the large amount of plant mass naturally consume nutrients and nitrates from the water very quickly, i tested the nitrate measurements using a API test kit and the results came up yellow, which means almost 0 nitrates in the water. This indicates that the plants are consuming more nitrates (and possibly more nutrients) than the bio-load can produce, hence i now have to regularly dose fertilizers which contain both micro and macro nutrients to keep up with the plants demand. 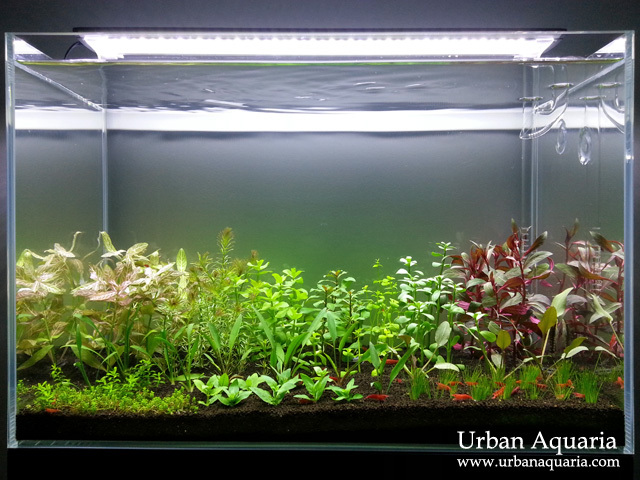 At the end of each week, a large water change is done to remove the excess nutrients and reset the nutrient levels. On a side note, most of the plants i choose are in the easy-moderate demand range, which are able to grow without pressurized Co2 injection (albeit at a slower pace, therefore less need to trim the plants as often). The approach for my future tanks will also be based on similar lower maintenance conditions. Congrats on all your tanks they all look amazing! I'm going to start planted tanks myself and was wondering how many litres of ADA substrate you used? near me they sell ADA in 3 litres and 9 litres and I'm not sure how much I'll need. keep up the tanks and post some more vids on youtube! For this 45cm tank, i'm using around 6L of ADA aqua soil, for my larger 60cm tank setups i use a whole 9L pack per tank. could u recommend any other product to replace tropico ferts? i unable to find one in my country. I'm not sure which other aquatic plant fertilizer products have similar all-in-one micro/macro nutrient contents as Tropica Specialized Fertilizer ... but perhaps you could check the Seachem range of fertilizers as an alternative. Hi..I'm abit late for this setup. Ur using ada amazon soil, I was told it tends to release ammonia and cycle will take bout 3mths time but it seems like u dont have such problem. Isit because the amount of plants u have? Yes, brand new ADA Amazonia aquasoil will usually release a higher level of ammonia and nutrients at the start, this is meant to supply ample nutrients to plants to boost their growth during the first few weeks of the tank setup. This is the period whereby the tank will cycle too (which can take anytime between 4-6 weeks or even longer, depending on setup), so when the tank is cycled, the plants would also have grown out nicely in the tank. But in the case of my tank, it didn't need to go through that initial cycling process because this same tank was actually a re-scape from a previous aquascape, so it was already cycled and the previous plants already used up most of the ammonia and nutrients from the soil. Thks again, I get it now. 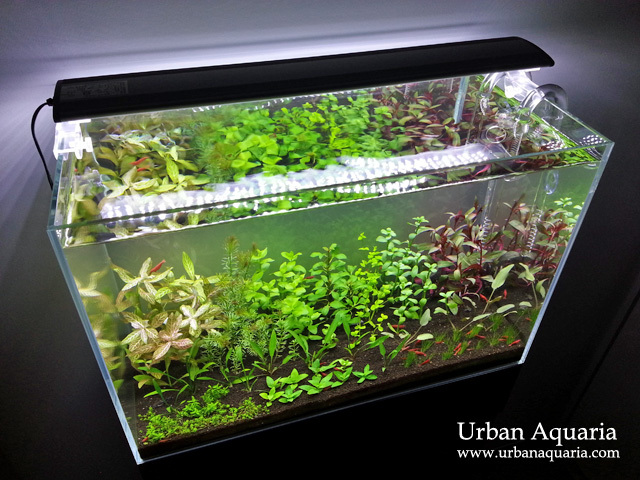 Not sure if u hve come across Tropica and TMC utube on their layouts from several well known aquarists. What I did was downloaded their hi-res videos combined it and play on large screen tv, it felt gd.